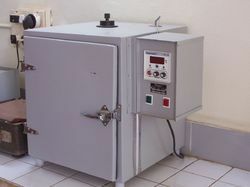 An autoclave is a pressure chamber used to sterilize equipment and supplies by subjecting them to high pressure saturated steam at 121 °C (249°F) for around 15–20 minutes depending on the size of the load and the contents. 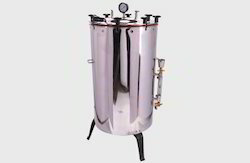 We have been able to cater to the various requirements of clients by providing Autoclave Portable. These products are manufactured by making use of high-grade stainless steel that are procured from the reliable vendors of the market. The products offered by us are widely demanded for complete & effective sterilization at the lowest possible coast. 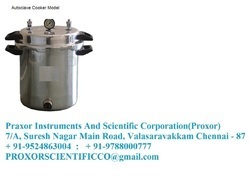 We have attained immense appreciation in the market owing to the superior quality of our vertical autoclave double drum, which comes with double safety valve to provide maximum safety to the users.The lid made using heavy duty gun metal and the double wall unit is a stainless steel chamber Desktop Autoclave Front Loading Desktop Autoclave Small space table top model 12, 18 and 23 Liter capacity models available Medical Autoclave Autoclaves are widely used in microbiology, medicine, tattooing, bodyfications.piercing, veterinary science, mycology, dentistry, chiropody and prosthetic fabrication. They vary in size and function depending on the media to be sterilized. Laboratory Autoclave We are one of the most trusted names in the industry engaged in manufacturing and supplying a wide range of Autoclaves. These autoclaves are widely used in varied industrial purposes. Our range is available in a number of dimensions and specifications that serve the demands and requirements of our valued clients. These autoclaves are manufactured using high grade raw material that ensures their durability. Owing to our vast experience in the concerned industry, we are offering a comprehensive array of BOD Cooling Incubator that is packed in safe cartons for providing safety from damage during dispatch process. These cooling incubators are widely used in testing and storing of sensitive cultures, vaccine culture of bacteria, micro organism, seed germination, serum incubation and others in laboratories. The offered cooling incubators are demanded within various laboratories for preserving chemicals and reaction. Digital Lab Incubator offered are made available by us in stainless steel finish with outer made of mild steel in powder coated finish so as to provide in these long lasting operation support. These incubators also feature gap between walls that come fitted with glass wool insulation so as to avoid heat loses. For superior performance, the heating elements are constructed using high grade chrome plated nichrome wire. With temperature controlled through thermostat, these also come with air ventilation support which is placed on top of both sides so as to effectively remove hot gases/fumes.